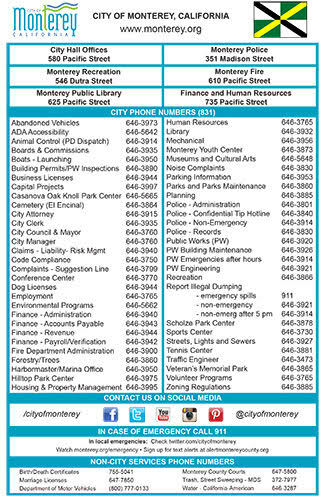 Ever want to call the Monterey Police’s non-emergency line or have a question about city Trees, you can either check their web site, view the graphic of all of the City’s phone numbers or, if you are a CONA member, get a magnetic version for your refrigerator. Use a neighborhood watch card to get to know your neighbor and keep important contact information about them in case of emergencies. Wouldn’t you like to have someone looking out for your house? We have a unique service to our residents, the city of Monterey Public Library bookmobile visits our neighborhood every other Thursday in front of the CONA Community Center and then on Lerwick. Residents can access the library catalog and have their selections brought out on the next bookmobile’s visit. Check the Bookmobile Page for exact days/times. 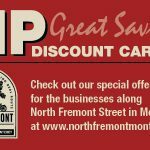 The North Fremont Business District of Monterey offers its “VIP Discount Card” (part of the Backstage Pass program) with special offers from many merchants. The CONA 2017 Annual Meeting was held on June 28, 2017 and the minutes are now available (.pdf). 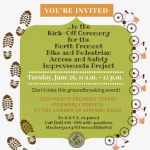 Many neighbors use Nextdoor, a neighborhood centered social web site which requires you to create an account to view your neighbor’s postings and allow you to post to your neighbors. The Casanova Oak Knoll Facebook page is open to the world, feel free to browse the page even if you don’t have a Facebook account. If you do have an account you can “Like” the page and add your own comments and pictures. The CONA 2016 Annual Meeting was held on June 22, 2016 and the minutes are available here.